There's the story about the MIT student who spent an entire summer going to Harvard football field every day wearing a black and white striped shirt. Each day he was seen walking up and down the field for ten or fifteen minutes throwing birdseed all over the field, blowing a whistle and then walking off the field. At the end of the summer, it came time for the first Harvard home football game. 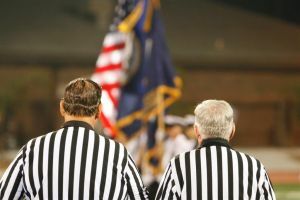 When the referee walked onto the field and blew his whistle, the game had to be delayed for half an hour to wait for the birds to get off the field.